Marc-Andre Fleury was a surprise addition to the Penguins' lineup for Game 3, but Mike Sullivan stuck with the goaltender who's been tearing it up in the Pittsburgh net. The decision paid off for him as Matt Murray was phenomenal, stopping 47 of 49 Washington shot in leading the Pens to a 3-2 win over the Capitals. They needed every save he made, as the Caps were successful in driving the play as Pittsburgh appeared to focus more on defending their zone than trying to generate offense on the other end. Patric Hornqvist, Tom Kuhnhackl, and Carl Hagelin were the goal scorers for the Penguins as the win gives them a 2-1 series lead. The Capitals came out flying to start the game, but the Penguins were selfless in getting in the shooting lanes, and Matt Murray stood tall when the puck got shot on net. Bryan Rust would head down the runaway after getting in the way of a pair of shots early in the period, and he wouldn't return to the game. The Pens would start to turn the tide, and it would be the Penguins getting on the board first. 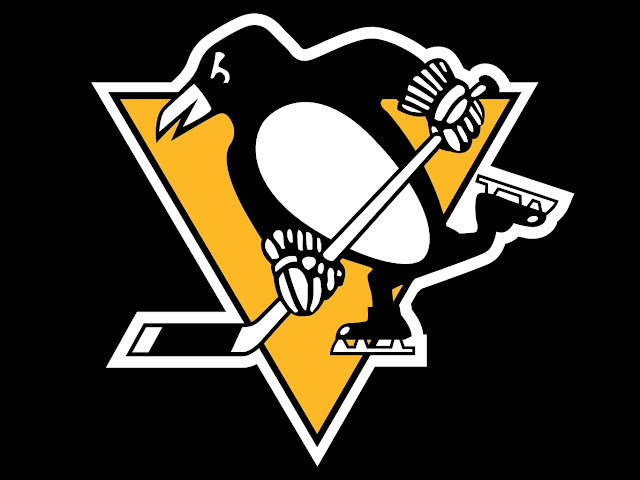 Trevor Daley would take a slap shot from the blue line, and Patric Hornqvist would deflect it from between the hashmarks, sending the puck bouncing off the ice and over Holtby to make it 1-0 Penguins. It wouldn't take much longer for the Pens to extend their lead further, again off a play in transition. Matt Cullen took the puck up the left side and attempted to give Tom Kuhnhackl a centering feed. Luckily for Pittsburgh, it took a fortuitous bounce and landed on Kuhnhackl's back and deflected into the goal to give the home team a quick 2-0 lead. Moments later, Justin Williams would get whistled for interference after a blatant pick on Derrick Pouliot in an attempt to give space for Evgeny Kuznetsov. It would send them to their first power play after an 0-5 job on the man advantage in Game 2 nearly proved to be the difference, but the Pens wouldn't find much in the way of scoring chances and Pouliot would get sent to the box with 27 seconds left in the opportunity after hooking Jay Beagle on an odd man rush to the net. The Capitals would go back on the power play after Kris Letang was sent off for interference late in the period. Marcus Johansson entered the zone stickhandling through several Penguins when Kris Letang stepped up and delivered a jolting, late check that left the Capital dazed. Johansson would leave the game, and while Justin Williams was able to send a shot pinging off the post Washington wasn't able to take advantage of the opportunity. Before Letang was able to get back to the bench from the box, he was able to draw a slashing penalty from Daniel Winnik that put Pittsburgh back on the power play with just under two minutes left in the 1st period. For the second time in as many opportunities, the Pens' power play would be ended by a penalty as Phil Kessel was sent off for slashing the stick out of T.J. Oshie's hands. Pittsburgh would take the 2-0 lead into the locker room for the first intermission despite conceding an 18-12 advantage in Corsi to Washington in the 1st period. The teams would play for 9 seconds at 4-on-4 to start the period before the Capitals would have a short power play. They wouldn't be able to convert, but Nick Bonino would block an Alexander Ovechkin slap shot that appeared to leave him hobbled for the remainder of the shift. 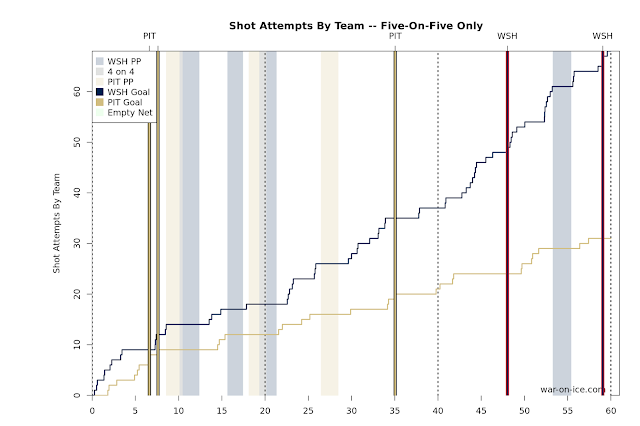 Eric Fehr would draw a tripping penalty from Williams midway through the 2nd period, but again Pittsburgh wasn't able to beat Holtby for a power play goal. It wouldn't be a Washington Capitals game if their players weren't needlessly taking cheap shots at the other team. Kris Letang crushed Ovechkin coming through the Pittsburgh zone, and while both players were down on the ice Backstrom went out of his way to clip Letang in the head while chasing after the puck. Unlike past seasons, the Penguins would make sure to get their payback on the scoresheet, and minutes later they did just that. Kessel made a great pass to get Bonino alone in front of Holtby, and Bonino would skate into an angle that allowed him to hit Carl Hagelin for the one time into the empty net. Letang would near tack on yet another goal in the waning seconds of the period, but his slap shot would hit off the left post and bounce harmlessly away. The horn would sound and start the second intermission with the Penguins holding a commanding 3-0 lead. The Caps would come out looking to get on the board early in the 3rd period, but it was Pittsburgh who nearly got the next goal on a Fehr one-timer from a Chris Kunitz slap-pass, but Holtby did a great job reading the play and getting into position to make the save. Washington would finally be able to get on board as Ovechkin simply overpowered Murray on a wrist shot from the left circle that beat the Penguin netminder glove high. It would cut the Pittsburgh lead to two, and it would come immediately after a rush down the other end of the ice where Daley would try to one touch a pass to Evgeni Malkin but sent it behind him. The 3rd period increasingly became Washington driving play into the Pittsburgh zone as the Pens focused mainly on just trying to kill time off the clock. Hagelin would take a needless tripping penalty against John Carlson with roughly 6 minutes left in regulation to give the Capitals a chance to pull within one on the man advantage, but the Penguin penalty kill was up to the task of killing it off. The Caps would pull Holtby with a bit over two minutes remaining in the game, and it would lead to a goal with the extra attacker to pull the score to 3-2. Ovechkin wristed a shot off the far post, and it took a perfect bounce for the Capitals right to Williams on the near crease, and he was able to bury it into the empty net. It was the worst showing in the possession department for the team under Mike Sullivan as they managed only a score-adjusted 35.5 CF%, though it was only a 12-9 Washington advantage through the first two goals. As good as Matt Murray has been, this still isn't a team that can pull everyone back and focus on defending their own zone as Mike Johnston found out in the beginning of the year. In the meantime, Pittsburgh will await clarity on Kris Letang's availability for the next game after his questionable hit on Marcus Johansson, and the teams will hit the ice Wednesday night for Game 4.